Hallo! How is your weekend? I have been to look at a few events, I will add photos later. But I am working, cooking and everything ather like in weekend. I decided to show you a little inspiration - Ralph Lauren Spring 2013. Really nice collection, especially scarves in hair is perfect trend. Nice Saturday. Ahoj! Bola som sa pozrieť na pár akciách, fotografie pridám neskôr. Okrem toho pracujem, varím a všetko.. Čo patrí k sobote. Rozhodla som sa ukázať vám malú inšpiráciu - Ralph Lauren jar 2013. Naozaj pekná kolekcia, najmä šatka vo vlasoch je výborný trend. Peknú sobotu. 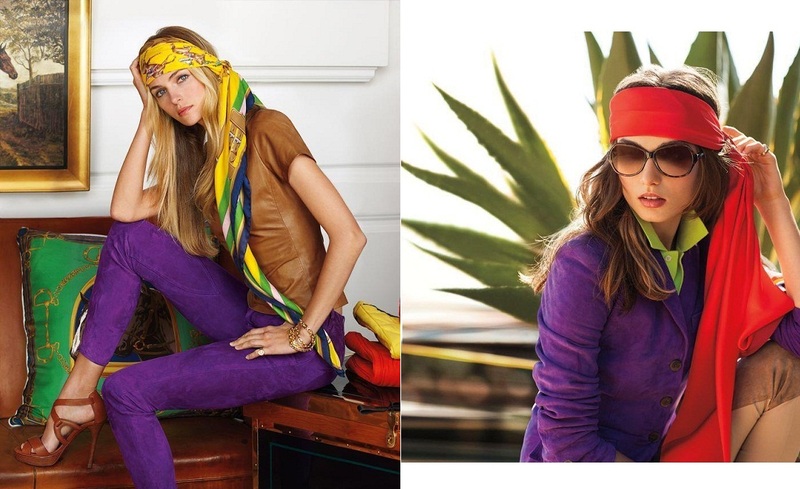 Ralph Lauren is great, I´m loving the first two outfits a lot! In love with this colorful and bright campaign! Beautiful! I am totally inspired by ralph lauren lately! Great inspiration! Always love Ralph Lauren. Especially liking the pants, shirt, and jacket in the first look. My weekend was great so far, thanks for asking. I cooked yummy food and came just back from a long walk with my lovely husband! Enjoy the rest of the weekend, dear Denisa! Nice post darling love your blog..If you want we can follow each other in GFC..Big hug from Valence Spain. I'm in love with that collection! Ralph Lauren is incredible! Very cute and colorful selections..
Is that a leather romper and long jacket in the second picture? Wow, I didn't think that would work really well, but that is so awesome!